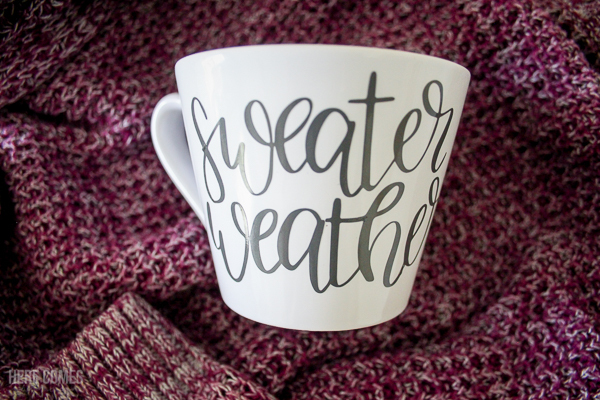 Create this fun and cozy hand lettered fall mug even if you don’t know how to hand letter! It’s Fall and time to cozy up with a cup of coffee or a pumpkin spice latte. I took a look in my kitchen cabinets the other day and noticed that I had absolutely no fun mugs. I’ve got plain mugs galore but nothing with fun sayings. And sometimes a fun saying is what you need to get going in the morning. 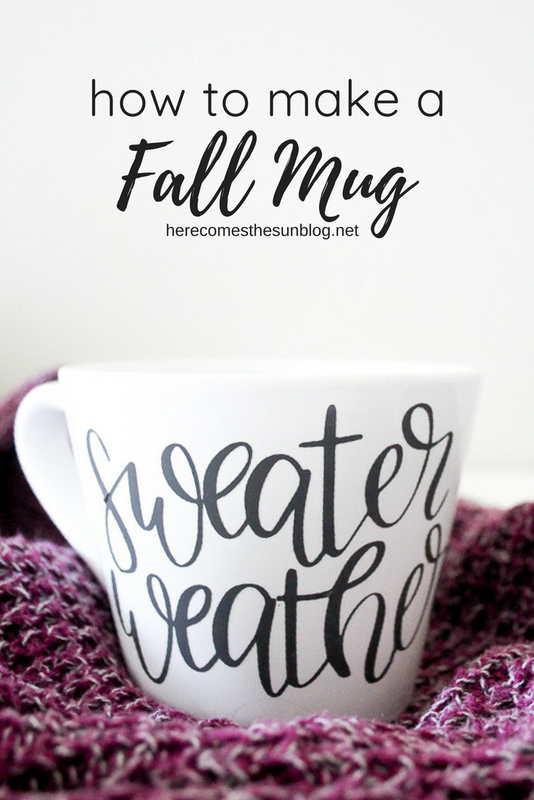 So I created this fall mug with a file from my recent Fall Quotes SVG files bundle. Although I’m not quite sure this mug will motivate me…. it will probably convince me to curl up with a good book. Download the fall quotes SVG files bundle. This bundle is for personal use only and will work in any cutting machine that utilizes SVG files. Cut out the “sweater weather” file onto vinyl and weed out the uneccesary parts, leaving only the text. The photo below shows the cut file already on the transfer tape. 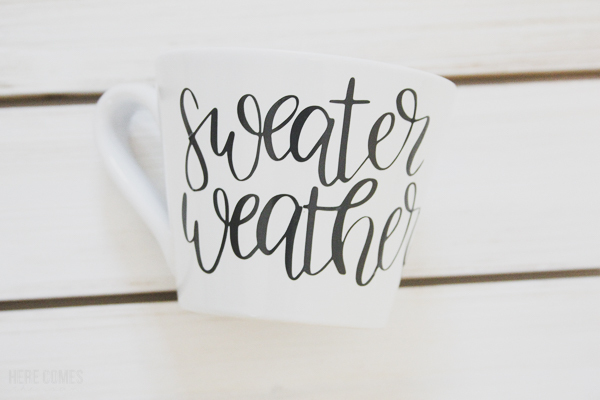 Isn’t this mug just the coziest? I can’t wait to fill it with coffee and snuggle up under a blanket with a good book. 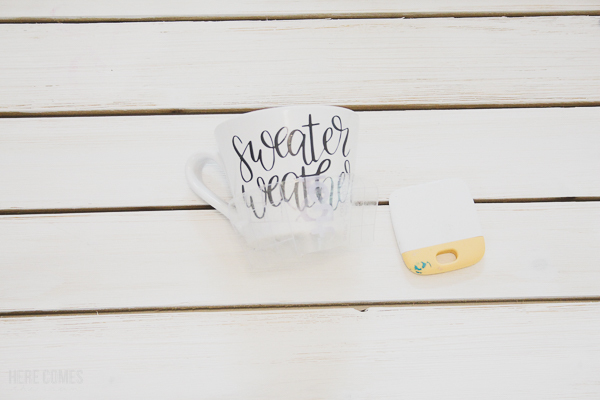 I mean, work… I can’t wait to fill it with coffee and get to work in the mornings! What type of vinyl should I use? I recommend a permanent vinyl such as Expressions Vinyl Oracal 651. This vinyl is waterproof and suitable for outdoor use. Can vinyl go through the dishwasher? I recommend hand washing your fall mug. This is such a great idea! 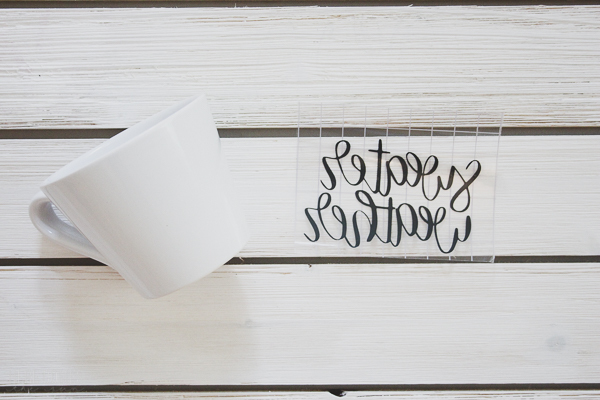 I can see make a set of mugs all with the different sayings on them. 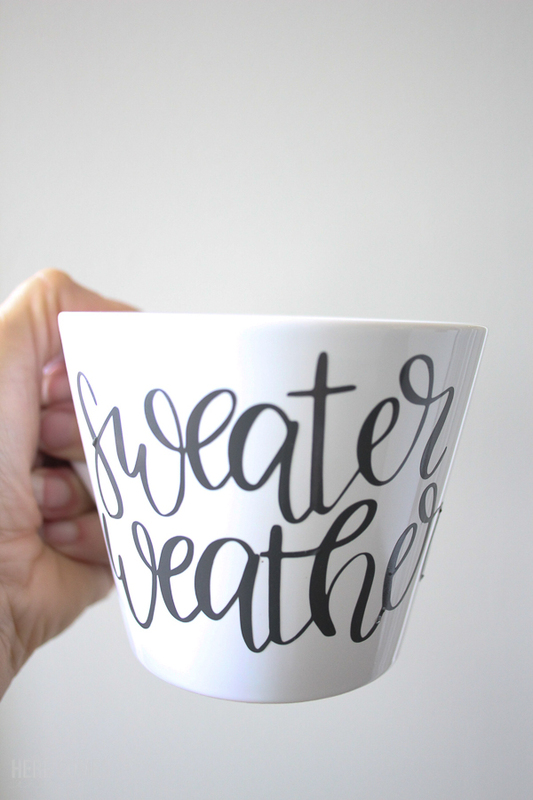 Our family is always asking if “this my cup?” to admit that “sweater weather” is my favorite. I am also I love with the mug you used! I love the shape! Is this something you already have, thrifted, or purchased? If purchased? Would you share the information? If they are from Amazon, you might be able to set it up as an affiliate link so you get a little fee back from Amazon for the courtesy link. That money could be donated to you Florence Neighborhood fund. Hi Tiffany! Thanks so much for visiting. I purchased the mug at Michaels.